Many KCTC members ran this years Hospital Hill on June 5th. 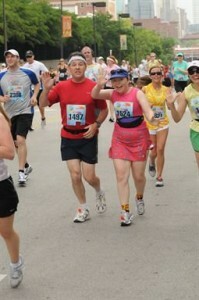 Despite the heat and humidity, Ann described it “Yet another joyful running moment with my friends, Dave and Patsy …. The best KC run EVER! I believe this was nearly at the end of Hill Numero Uno.” Some of the rest of us were just glad it was done. And those free towels came in very handy at the Crown Center fountains.